TECHknitting: Chain selvedge a.k.a. "slipped selvedge"
If you slip the first stitch of every row (or every last stitch--makes no difference) you will get a lovely chained selvedge--a big improvement over the lumpy bumpy edges much knitting exhibits. When the time comes for picking up stitches (for a neck edge or a front band, or around the heel tab of a sock) you will be glad you have lovely, even chains to pick up through. Here is chain selvedge by the "slip the first stitch" method, in four illustrated steps. 1. (Below) Knit the last stitch of the row through the back loop (tbl), as illustrated. 2. 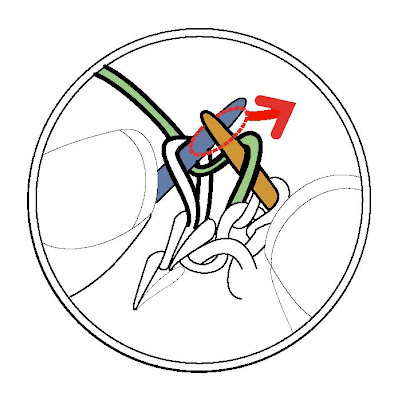 (Below) Draw the new stitch (green) up onto the right needle (brown) with the right "arm" of the new stitch forward, as illustrated. 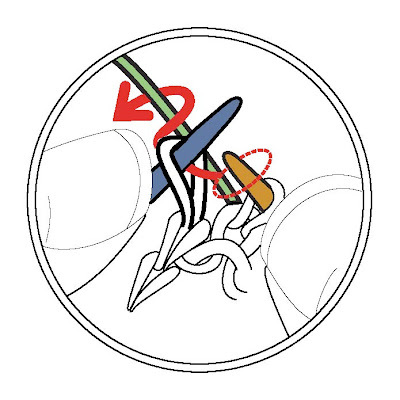 Withdraw the left needle (blue), leaving all the stitches on the right needle. 3. (Below) Switch the needles in your hands. The needle which used to be the right needle (brown) has become the left needle with all the stitches on it, the needle which used to be the left needle (blue) has become the empty needle held in the right hand. 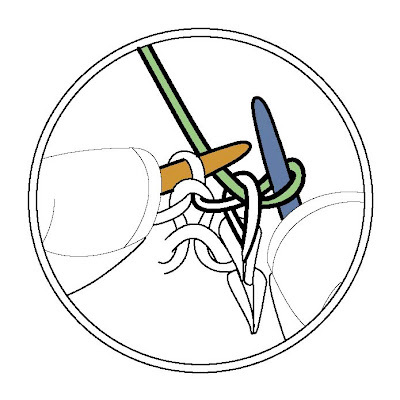 With the right hand holding the empty needle (blue), DO NOT KNIT the first stitch (green), but merely slip it PURLWISE from the left needle to the right needle. Knit the rest of the stitches as you normally would, until you come to the last stitch. Repeat from step 1 through 3 for the length of the knitted piece. 4. 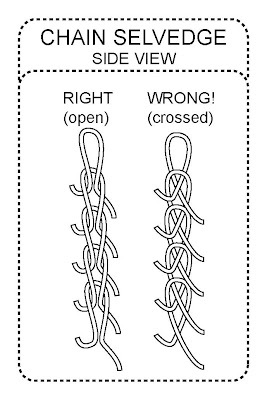 (Below) If you have followed the above instructions, the slipped stitch should lie "open" as illustrated on the left. PS: Note that if you choose to work a slipped selvedge, it is very common to add 1 stitch at each edge of your knitting (2 stitches total). In other words, if your pattern calls for casting on 30 stitches, you would actually cast on 32, thus assuring that your slipped selvedge in no way interferes with whatever the pattern instructions are. Naturally, if you look over the pattern and see that the edges are simply plain anyway, you could just work the slipped selvedge on the two edge stitches without adding. Yet, even in this context, many confirmed slip-stitches would go ahead and add the two stitches anyway, out of habit.